SAN DIEGO — A year removed from the implementation of San Diego Bay’s hull cleaning permit requirements, businesses, marinas and boat owners appear to be on board with the new environmentally minded plan. The topic was discussed at the San Diego Board of Port Commissioners’ July 10 meeting, where environmental programs manager Karen Holman said the majority of businesses employing hull cleaning divers were complying with the ordinance, and the port had received very few complaints, thus far. In July 2011, the Port of San Diego approved a first-of-its-kind hull cleaning permit requirement for hull cleaning operations in San Diego Bay. 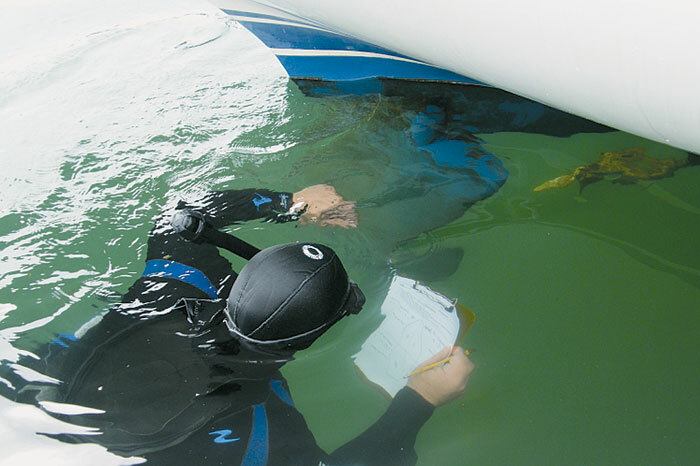 The port created a plan that would require hull cleaning businesses to pay $250 for the permit, adopt a list of port-approved Best Management Practices that would ensure no ill environmental effects from hull cleaning and train divers in those practices. The ordinance was enforced starting in November 2011, after the Port of San Diego staff issued 55 permits in October. Over the past six months, the port staff has conducted 40 inspections of hull cleaning businesses and responded to some citizen complaints, but has only encountered one instance where a visible paint plume violation occurred. A total of six verbal warnings and four citations have been issued by the port for permit violations. In addition to the update, commissioners approved two changes to the ordinance: The first change adds language stating that businesses with in-water hull cleaning permits are required to adhere to all permit terms and conditions: and the second amendment helps clarify which businesses are required to obtain a permit, allowing for non-professional hull cleaners to get a permit and clean boat bottoms legally. The revised language worried commission chairman Lou Smith and secretary Lee Burdick, who thought the new language could potentially require private boat owners to obtain a permit to clean their own vessels. “When I read this, I thought, ‘my god, boat owners are going to have to get a permit now,” Smith said. But after clarification, an exemption was clarified in the ordinance assuring that private boat owners who clean the hulls of their own vessels are not required to obtain a permit. “We believe that the proposed amendments will help to streamline the ordinance, improve its clarity and facilitate enforcement, thereby leading to improved water quality,” Holman said. The port implemented the regulation of hull cleaning businesses in July 2011, in an effort to reduce the levels of copper and meet the Regional Water Quality Control Board’s Total Maximum Daily Load (TMDL) limits for Shelter Island Yacht Basin, which has been identified as an impaired body of water. As a result, the water board developed a regulatory order that requires the port, marinas, yacht clubs, hull cleaners and boaters to reduce copper pollution in Shelter Island Yacht Basin by up to 76 percent by 2022. Studies have shown that boats are the largest source of copper in the waterway. In addition, it has been claimed that the use of overly abrasive cleaning techniques and tools contribute to the copper levels. Also approved at the meeting was a change in how hull cleaning permit identification cards will be distributed. Until now, ID cards were issued by individual hull cleaning businesses, but multiple hull cleaning companies complained that counterfeit cards were being made and misused in the marinas. The new plan will put the port in charge of creating and distributing the cards, in an effort to prevent counterfeiting. The cards are expected to be in place by the end of the summer, and businesses will be notified of the change and provided time to acquire their identification cards. One change discussed during the public meetings involved the removal of non-copper-based paints from having to adhere to the visible paint plume rule. Some hull cleaners and boaters voiced concerns that zinc-based paints, which contain no copper, create a visible paint plume easier than other paints, but they do not cause copper leeching in the bay. If the ordinance was crafted to exempt boats with non-copper-based paints from adhering to the visible paint plume rule, hull cleaners could clean those boats more effectively. Holman said that the ordinance could appear weakened if exemptions are made for certain paints, but expects to revisit the issue next year, as the two-year permit plan reaches its end.